I'm excited to be taking part in my very first Sunday Supper Movement event. Sunday Supper is a group of bloggers on a mission to bring back Sunday Supper around the family table in every home. They often will partner with brands and services that are like minded and believe in the power of their mission. This week the group is showcasing warming trends including: soups, stews, desserts and drinks. Nothing warms me up more than a steamy bowl of soup. Since I often eat soup as a main dish I like it to be hearty. Loaded with good for you chickpeas, this creamy soup fits the bill! Heat the oil in a large sauce pan over medium heat. Add garlic, rosemary and crushed red pepper. Cook, until the garlic becomes fragrant, about 1 minute. Add chickpeas and cook 2 minutes, stirring constantly. Add water and bring to a boil. Reduce heat and simmer 30 minutes. Using a hand blender, puree soup in pot. Season with salt and pepper and serve. I've never made a chickpea soup but the addition of the rosemary sounds amazing! Simply delicious, I love the chickpeas with the rosemary! this sounds like a perfect weeknight dish! Such a fun alternative to hummus for all those chickpeas in my pantry! Welcome to Sunday Supper. This recipe intrigues me...it is going on my to make list. I have never had chickpea soup - looks good! I love the concept of Sunday supper!! Great soup to make for it! This looks like a great start to Sunday Supper! Welcome to Sunday Supper! Beautiful looking soup. I love the rosemary garnish. I've never had chick pea soup but really like them a lot. Great recipe that comes together so quickly -- looks like you spent a lot more time on it! I love this soup! So simple and full of goodness! 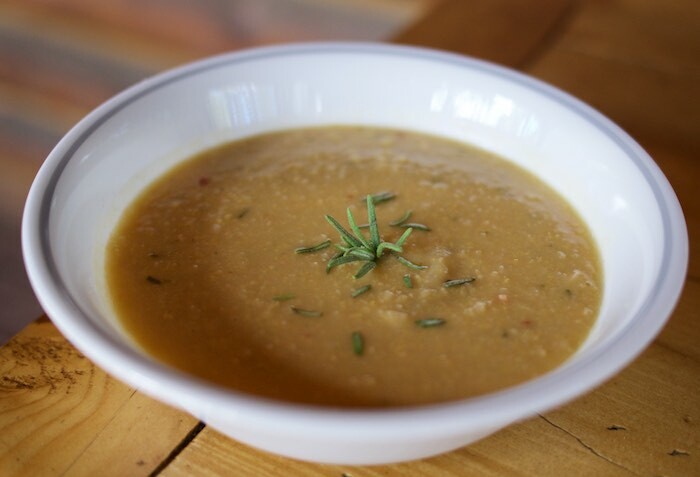 I love the sound of a pureed chickpea soup...and the rosemary is just the perfect complement! I love chickpeas in soups and stews but for whatever reason it has never occurred to me to puree them for a creamy soup - great idea! Oh I love this soup, it looks so creamy and healthy! I love rosemary too! I never thought to make chickpea soup... but I love the ingredients that went into this, looks healthy and flavorful, I will try it out!! Yum! I have never eaten chick pea soup! Love how creamy the soup is because of the chickpeas, I bet the rosemary adds a lovely flavor. Lots of great recipes included too. Quick, easy, and has my favorite spices. What a win!!! Always looking for new soup recipes! Thanks for sharing! It's been a long time since I've made a blended chickpea soup, but this looks so hearty and delicious! Yum! I would never have considered blitzed chickpeas for a soup. The rosemary addition sounds fantastic! I may have to try this with some homemade frozen chicken stock instead of water. Gotta find a way to use it all up, right? I've never heard of chickpea soup before, but now I have to have it in my life! Looks wonderful! Ohhh I've never thought to make soup with chickpeas! This looks great! Simple and delicious. That's my kind of soup! I'm always ready for a great bowl of soup, yum!!! I love the Sunday Supper crew. Best people in the world. You'll love posting with them, such a fabulous bunch of bloggers. This recipe is amazing. Nothing better than a hearty bowl of soup as the weather cools down. Wow, I've never seen chickpeas used in this way. Thanks for introducing me to this preparation! You can't beat hearty soup, especially during the colder seasons. I love chickpeas. Yum! I love chickpeas in soup! I love chickpeas but never think to throw them in soup. I gotta get on this! Sounds easy and hearty! Thanks so much for sharing it at Savoring Saturdays. Hope to see you back this weekend!